where c is a fixed non-negative real coefficient. A solution of this equation can be quite complicated, but it can be analyzed as a linear combination of simple solutions that are sinusoidal plane waves with various directions of propagation and wavelengths but all with the same propagation speed c. This analysis is possible because the wave equation is linear; so that any multiple of a solution is also a solution, and the sum of any two solutions is again a solution. This property is called the superposition principle in physics. The wave equation is the simplest example of a hyperbolic differential equation. It, and its modifications, play fundamental roles in continuum mechanics, quantum mechanics, plasma physics, general relativity, geophysics, and many other scientific and technical disciplines. This equation is typically described as having only one space dimension x, because the only other independent variable is the time t. Nevertheless, the dependent variable u may represent a second space dimension, if, for example, the displacement u takes place in y-direction, as in the case of a string that is located in the x–y plane. which is from the definition of a second derivative. KL2/M is the square of the propagation speed in this particular case. From this, v must have the form G(x + ct), and from this the correct form of the full solution u can be deduced. depend in general on any initial and boundary conditions of the problem.
. The chirp wave solutions seem particularly implied by very large but previously inexplicable radar residuals in the flyby anomaly, and differ from the sinusoidal solutions in being receivable at any distance only at proportionally shifted frequencies and time dilations, corresponding to past chirp states of the source. , an example of the inverse-square law. These formulas provide the solution for the initial-value problem for the wave equation. They show that the solution at a given point P, given (t, x, y, z) depends only on the data on the sphere of radius ct that is intersected by the light cone drawn backwards from P. It does not depend upon data on the interior of this sphere. Thus the interior of the sphere is a lacuna for the solution. This phenomenon is called Huygens' principle. It is true for odd numbers of space dimension, where for one dimension the integration is performed over the boundary of an interval with respect to the Dirac measure. It is not satisfied in even space dimensions. The phenomenon of lacunas has been extensively investigated in Atiyah, Bott and Gårding (1970, 1973). We want to find solutions to utt − Δu = 0 for u : Rn × (0, ∞) → R with u(x, 0) = g(x) and ut(x, 0) = h(x). See Evans for more details. would need for one fourth of the length of the string. without being actively constraint by the boundary conditions at the two extremes of the string. The shape of the wave is constant, i.e. the curve is indeed of the form f(x − ct).
. The constraint on the right extreme starts to interfere with the motion preventing the wave to raise the end of the string. with the wave starting to move back towards left.
. The wave now travels towards left and the constraints at the end points are not active any more. When finally the other extreme of the string the direction will again be reversed in a way similar to what is displayed in figure 6. One method to solve the initial value problem (with the initial values as posed above) is to take advantage of a special property of the wave equation in an odd number of space dimensions, namely that its solutions respect causality. That is, for any point (xi, ti), the value of u(xi, ti) depends only on the values of f(xi + cti) and f(xi − cti) and the values of the function g(x) between (xi − cti) and (xi + cti). This can be seen in d'Alembert's formula, stated above, where these quantities are the only ones that show up in it. Physically, if the maximum propagation speed is c, then no part of the wave that can't propagate to a given point by a given time can affect the amplitude at the same point and time. Note that in this equation, both force and displacement are vector quantities. Thus, this equation is sometimes known as the vector wave equation. As an aid to understanding, the reader will observe that if f and ∇ ⋅ u are set to zero, this becomes (effectively) Maxwell's equation for the propagation of the electric field E, which has only transverse waves. ^ Cannon, John T.; Dostrovsky, Sigalia (1981). The evolution of dynamics, vibration theory from 1687 to 1742. Studies in the History of Mathematics and Physical Sciences. 6. New York: Springer-Verlag. pp. ix + 184 pp. ISBN 978-0-3879-0626-3. GRAY, JW (July 1983). "BOOK REVIEWS". Bulletin (New Series) of the American Mathematical Society. 9 (1). (retrieved 13 Nov 2012). ^ Gerard F Wheeler. The Vibrating String Controversy, (retrieved 13 Nov 2012). Am. J. Phys., 1987, v55, n1, p33–37. 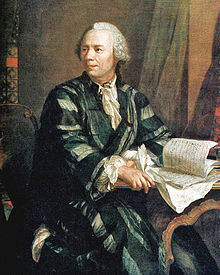 ^ For a special collection of the 9 groundbreaking papers by the three authors, see First Appearance of the wave equation: D'Alembert, Leonhard Euler, Daniel Bernoulli. – the controversy about vibrating strings (retrieved 13 Nov 2012). Herman HJ Lynge and Son. ^ For de Lagrange's contributions to the acoustic wave equation, one can consult Acoustics: An Introduction to Its Physical Principles and Applications Allan D. Pierce, Acoustical Soc of America, 1989; page 18 (retrieved 9 Dec 2012). ^ a b c Speiser, David. Discovering the Principles of Mechanics 1600–1800, p. 191 (Basel: Birkhäuser, 2008). ^ Tipler, Paul and Mosca, Gene. Physics for Scientists and Engineers, Volume 1: Mechanics, Oscillations and Waves; Thermodynamics, pp. 470–471 (Macmillan, 2004). ^ Eric W. Weisstein. 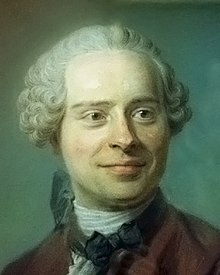 "d'Alembert's Solution". MathWorld. Retrieved 2009-01-21. ^ D'Alembert (1747) "Recherches sur la courbe que forme une corde tenduë mise en vibration" (Researches on the curve that a tense cord forms [when] set into vibration), Histoire de l'académie royale des sciences et belles lettres de Berlin, vol. 3, pages 214–219. See also: D'Alembert (1747) "Suite des recherches sur la courbe que forme une corde tenduë mise en vibration" (Further researches on the curve that a tense cord forms [when] set into vibration), Histoire de l'académie royale des sciences et belles lettres de Berlin, vol. 3, pages 220–249. See also: D'Alembert (1750) "Addition au mémoire sur la courbe que forme une corde tenduë mise en vibration," Histoire de l'académie royale des sciences et belles lettres de Berlin, vol. 6, pages 355–360.